I am not usually an early adopter when it comes to food. Out of convenience (some may call it laziness), I tend to stick to my tried and tested favourites. Macarons have been the new black ever since Adriano Zumbo made that Macaron Tower on ‘Masterchef’ last year. However, despite my best efforts, I have not really been swayed to replace my usual afternoon chocolate fix with a macaron – that is, until now. A former lawyer from ********* I know has just opened a macaron store called La Belle Miette in Hardware lane between Bourke and Little Bourke ….I don’t usually get excited about this sort of thing but I went there today and they are amazing – I recommend you check it out. With such a glowing endorsement, I immediately organised a ‘macarcon date’ with the Film Buff Lawyer, my friendly macarcon connoisseur. The Film Buff Lawyer and I made the trek up Hardware Lane and were greeted by the most lovely and chic patisserie. The shop window is adorned with jewel coloured macarons - ranging from deep raspberry red and dark chocolate, to soft and pretty pastel rose and violet – which really ‘pop’ against the crisp, white interior. The effect is simply gorgeous. I had intended to only buy one macaron as an afternoon treat, but when I saw the gorgeous gift boxes, I could not resist buying a few extras to take home and share with The Brooding Architect (it is Valentine’s Day after all). Each macaroon consisted of two perfectly domed topped almond biscuits, which are sandwiched together with a generous layer of ganache. The smooth crispy biscuit shells hide a soft, moist centre – which is only revealed after your delicious first bite. The Brooding Architect was a little skeptical about the Olive Oil & Vanilla flavour – but was pleasantly surprised to discover a rich, sweet vanilla flavour, enhanced by the subtle taste of fruity olive oil. 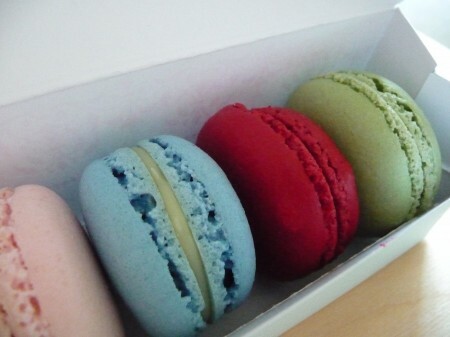 My personal favourite was the Rasberry Ganache Macaron. Not only is the deep red colour beautiful to look at, but the tangy rasberry ganache filling perfectly offsets the sweetness of the almond biscuit. A special mention must also go to the 72% Cocoa Macaron, an absolute treat for dark chocolate lovers. It is wonderfully rich and bitter, again contrasting beautifully with the sweetness of the almond biscuit. 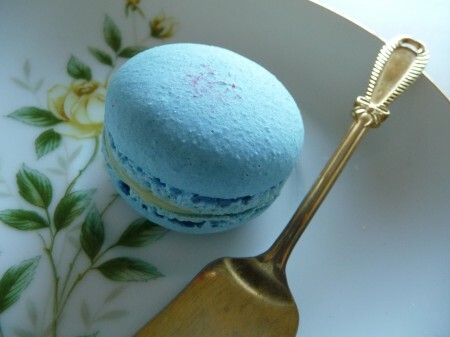 I was told by Hugh, one of the ‘macaron masters’ who runs La Belle Miette, that they also stock some fantastic French teas to sip while you enjoy your macaron. It sounded like a wonderfully lady-like and civilised way to enjoy the afternoon. However, Hugh and his partner are presently responsible for both baking the treats and serving at the counter. As such the seemingly never ending lunchtime queue, makes it logistically challenging for them to run the coffee machine as well. A mid-morning coffee break is definitely the more leisurely option at the moment. I highly recommend making the trek up to La Belle Miette and tasting these fabulous macarons for yourself before the lunchtime queue gets even longer! Vanilla and olive oil…mmmm. Definitely worth a return visit soon – this time with coffee! Oh wow. I. Am. So. There. I love macarons like any other person so I’m definitely going to make the walk from my office to this place and back on Monday! Libby: A very belated reply – but I was up at La Belle Miette last week and just thought I should give you a hot tip about their latest flavour – salted caramel. Simply amazing. I just visited this place today and it was fantastic – am def going to have to try the raspberry you mention on my next visit! 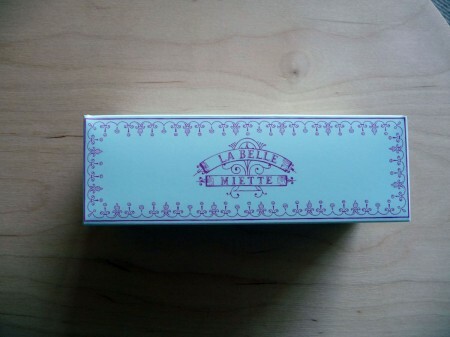 My friend just returned to Central Queensland with a little box of treats from La Belle Miette. Oh my how delightful and flavoursome they are. I am coming to Melbourne if only to buy some more. Congratulations La Belle Miette you macaroons travel far and wide. how much does a box of these cost? 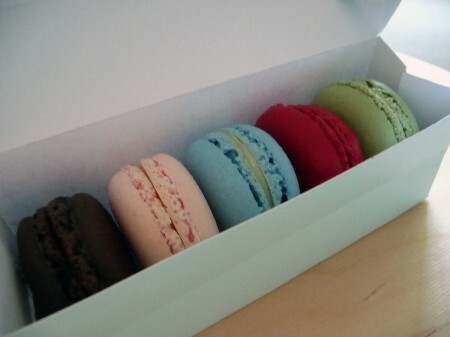 Nono: The price will depend on the number of macarons they can fit into your box. The small boxed contain 5-6 macarons, so will be between $12.50 and $15 and the large boxes fit around 12 macarons, so will be $30.